Ian's first bands were typical cover bands and short-lived original garage bands. 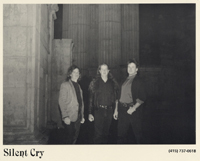 Ian joined his first real band, Silent Cry, in 1993, playing progressive metal with constantly changing time signatures. Unable to ever find a permanent vocalist, Silent Cry disbanded on friendly terms a year and a half later. Ian spent the next summer playing free lance gigs for cash in smoky bars in the San Francisco area, where he often found himself playing R&B covers with guys twice his age. When a good opportunity arose to acquire free recording time, Ian recorded a short demo of himself playing different styles, accompanied by the ex bass player from Silent Cry, Keith Mitchell and Tim Beckstien on guitar. Armed with this tape, he moved to Los Angeles. Once in Los Angeles, he was almost immediately offered the chance to join the band Near Death Experience, a dark pop/rock band, who had just released their first CD. Over the next four years Near Death Experience would play everywhere in the greater Los Angeles area, showcase to every label in the world, be written up in nearly every industry magazine, and become a dominate band on the LA scene. During this time, Ian was also given the opportunity to play on the UPN Channel 13 News theme. With Near Death Experience, Ian recorded the single, "Anastasia," which received college radio play across the USA, and was featured on the Triple X/Hollows Hill compilation album "Dim View of the Future" as well as the Foundation Forum 1997 compilation CD. However, after several member changes, management changes, and a changing music scene, Ian and the then remaining band members decided to put NDE to rest to explore other options. Next, Ian recorded an industro dance single, "On Your Knees" with singer, songwriter and multi-instrumentalist, Dieta Klaus, which was released under the name "Idol Worship." The single quickly got the duo a lot of acclaim, and an offer to play at the Key Club on a Saturday night. Idol Worship's first show ever drew 250 people, which lead to more gigs, including playing at the House of Blues for the Los Angeles Music Awards. Idol Worship went on to win several local awards, and was named among the Best Unsigned bands by Music Connection Magazine. Idol Worship went to work on recording a full album, while their first single, and a follow up single, "My Darker Side" received regular spins at six Los Angeles area dance clubs. Idol Worship continued to gather critical acclaim, and record contract offers. But just as quickly as Idol Worship had gone from non-existent to the top of the Los Angeles scene, the band fell apart. Well before the band's demise, Idol Worship had taken a break for some needed rest. During this time, Ian hooked up with some close friends and joined the Death Rock band "Without Tears". Based solely on the various band members reputations, Without Tears' first show packed the Que Sera in Long Beach to full capacity, which led to the invitation to play the prestigious El Rey Theater. After Idol Worship, Ian continued to gig with Without Tears. Using his own home studio, Ian recorded Without Tears' six-song demo "Tatters" and a song for the tribute album to Rozz Williams of Christian Death. The next few years Ian worked on a variety of projects, including recording with former Silent Cry bassist Keith Mitchell. In 2006, Ian formed a new band, The Myriad Form, who have quickly have attracted an international fanbase, and are regularly getting spun by Djs in Los Angeles, Seattle, Chicago, East Coast, the UK, Germany and more. In addition to playing drums with The Myriad Form, he has done all the engineering for their recordings, as well as played guitar on 5 songs, and wrote all music and lyrics for one song "
A full length album from The Myriad Form was released in 2007, which sold copies from Japan to the Netherlands, from Germany to Brazil. Songs from the album were played on radio stations WEFT 90.1 FM, Champaign IL, KTUH 90.3 FM Hawaii, INDIE 103.1 FM Los Angeles, Theory Radio.com, Chickit Radio (Italy), Industrial Radio (Germany). In 2011, Ian was aksed to write a score for the movie "Revenge of the Petites", which was released in 2012. "Revenge of the Petites" won for best Music at the Xbiz360 awards, and was nominated for Best Sound Track by AVN. In 2013, Ian is writing a Sound Track for a new movie, expected to be released later in the year.